The best way to explain the difference between management and leadership is with the popular phrase, “You manage things, you lead people.” Management is about doing the reports and staying on top of the projects. It’s getting the time cards validated, it’s about getting things in, getting things out. Leadership is about leading people. That’s the difference. 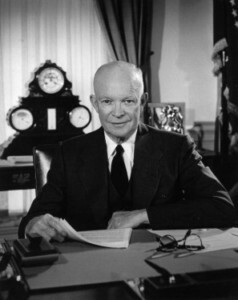 Dwight Eisenhower used to demonstrate leadership by taking a 12″ piece of string and laying it on the conference table stretched out. He would tell a single person to put their finger on one end of that string. He would tell them to push the string. Where does it go? It curls up. He would then take the string and stretch it back out and tell somebody to put their finger on the string and tell them to pull it. It will follow them everywhere they go. Great leaders are about developing great followers. How do they develop great followers? They understand how to motivate, they understand how to delegate, and they understand how to develop and nurture employees.